As you can see from the popular series, Clever Yoga Tips for Busy People, yoga can be done while walking, driving and even taking a shower, and yes, there is also something called Chair Yoga, which you can do while sitting comfortably in your office or cubical as well . The credit for the inspiration for this article goes to my cousin and close buddy Ashim. He emailed me this morning and said he was enjoying Chair Yoga using the pranayama techniques taught in the Free Online Yoga Breathing Exercises Video series. This is really a great way to incorporate some excellent breathing techniques into your busy life, and in this article I will give you a nice condensed set of pranayamas to get you started with your own Chair Yoga program. This Chair Yoga Pranayama set is going to become part of our ongoing Free Online Yoga Breathing Exercise (Pranayama) e-book here on Mastery of Meditation. Help you focus and concentrate. Help you develop intuition and unleash creativity. Help you to connect to your Higher Consciousness. Sit up nice and straight and have your feet flat on the floor. Try not to use the back support of your chair. Place your hands on your knees, relax your shoulders and let your stomach become soft and relaxed as well. Let your eyes relax as well and just keep an unfocused gaze, angling down in front of you. Next begin Breath of Fire Kundalini Yoga style for 1 full minute. Keep in mind that if at any time you start to feel dizzy or feel you are overdoing it, either slow down or switch to normal breathing till you feel ready to continue again. Breath of Fire is going to wake you up, get your energy flowing and harmonize your entire system. Finally, do the following breathing pattern for the last 2 minutes to really soothe your system, focus your mind and help you feel integrated, centered and connected. This is called Step Breathing. Inhale slowly taking 5 seconds to complete the inhalation, hold your breath in for 5 seconds, exhale slowly taking 5 seconds to complete the exhalation and then hold your breath out for 5 seconds. So 1 entire cycle will take 20 seconds, and you will be able to do 6 full rounds of this breathing in the 2 minutes. If the 5 second intervals are too much initially, just start with 3 seconds or 4 seconds and work your way up. After you are done with your set. Close your eyes, take a deep breath, hold it in, smile, exhale and then get back to work . The set above may be short, but since it consists of breathing exercises that require breath retention and rapid breathing, so it is important to observe the guidelines I have laid out in the article, Beginner’s Guide to Yoga Pranayama. 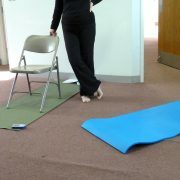 Of course, Chair Yoga does not have to be done in the office alone, and you can practice this set anywhere at anytime. Also, if you are looking to boost energy, you can do more of Breath of Fire, while if you are looking for more stress relief you can do more of the Step Breathing exercise. If you are looking for a full length pranayama video, you can check out the Best Beginner’s Yoga Breathing Exercise product that is available on the website. I hope you enjoy the Chair Yoga set above, and find it useful in your personal and spiritual evolution. PS: For those who were searching for Chair Yoga Pose, but ended up here instead, here is the link to that pose: Chair Yoga Pose for Sexual Health. The chair Yoga activity is amazing! It is one of the simplest and most effective technique that I tried to relieve stress. It also takes the least amount of time and that is just perfect for a busy mother like me. Thank you so much! Thank you all for your encouraging comments and words. Happy to share with all of you, and great to have your presence and input on the blog :-). What a wonderful article and great service you are offering the world – thank you. I love yoga and all the pranayama exercises and use these with my clients for stress management. I find that the modern world is so in need of these ancient techniques. Hi Anmol, I came to your site today following a google blog alert but I have visited your site before. I just love it and marvel at how much you have to share and how well you do it. What a tremendous ‘service’ this is! Beautiful Light Meditation for Developing Intuition, Joy and Creativity Survey Results: What Do Relationships Need Most?